Shaming Cast Members | What's the Point? This morning, while enjoying my morning cup of coffee and perusing Facebook, I came upon a post in a group of former Disney College Program participants. The person posted a photo of a current Cast Member, using her name. He complained that Cast Members have been rude his whole trip to Walt Disney World and that when he was a Cast Member in the 1990s, he would have never been as grumpy and rude as this particular Cast Member. The photo showed a Disney's Hollywood Studios Cast Member who wasn't smiling. It would be a stretch to say that she was frowning, in fact. She just wasn't smiling. He also said that she wasn't friendly when she was asked questions. Was this good show? No, it wasn't. If she was in fact, not friendly, was she doing her job correctly? No, she wasn't. Was it right for her photo to be plastered on Facebook? HELL NO. Being a Cast Member isn't all fun and games. In fact, it's hard work. You work long shifts. Nine months out of the year you're in oppressive heat. Guests can be incredibly rude sometimes. You're making a small living wage and you don't get a lot of vacation or personal time. It isn't feasible to say whenever you aren't feeling it, you should call out of work. Does this mean that Cast Members can be rude to guests on the regular? Nope. But guests should try to be understanding. 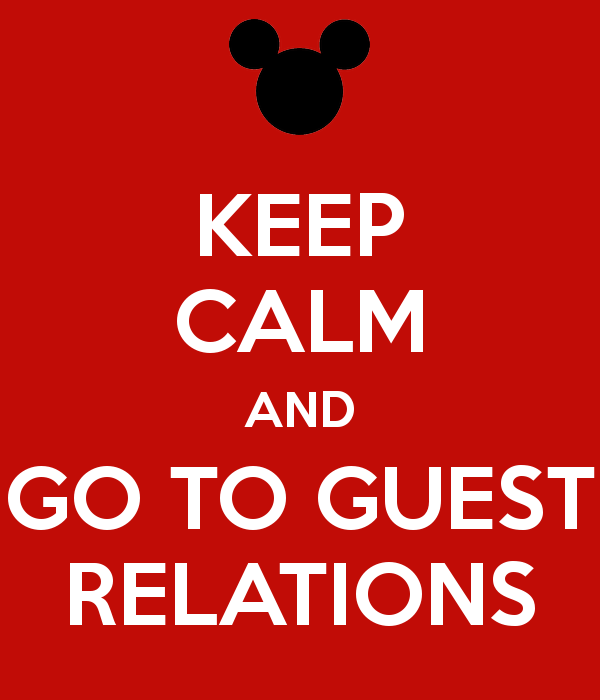 Guest Relations can be your advocate. Maybe this man was right. Guest service is lacking lately. (I highly doubt this, but I'll play along) This Cast Member wasn't providing superior guest service. He was offended by her actions. The next step is simple. Go to Guest Relations and file a complaint. Maybe it was after he left the park and was still bothered by her behavior. Then email Walt Disney World and tell them how disappointed you are at wdw.guest.communications@disneyworld.com. Be an adult and go through the proper channels. Don't act like a 13-year-old and shame someone on social media. Which brings me to my last point. Online bullying is never OK. This man argued that she was "on stage" and therefore, she is allowed to be photographed. Yes, that is correct. However, she did not deserve to be bullied. I am a part of the camera phone generation. This event was not worthy of a photo. Maybe if we just put down our phones for two minutes and stop looking through the lens of technology we would see things a little clearer and put things into perspective. There are over 65,000 Cast Members in Walt Disney World. Are there good Cast Members and bad Cast Members? Sure. I'm not naive in thinking that all Cast Members preserve the magic every shift. All I'm saying is that we should think before we post. If this Cast Member compromised the safety of guests or something more serious, I could almost understand the outrage. However, if she "ruined" your vacation by frowning, then maybe you're the problem. What's the point? Take a chill pill, don't bully people online, and if you've been offended at Disney, go to Guest Relations. Thanks Heidi. It's particularly bad when it's a former cast member doing it. What ever happened to enjoying your vacation and your family? This is GREAT! Guest Relations exists for a reason, and people really need to utilize those services rather than complaining into the ether of the Internet. People are bullies, and too many of us wear our bullying as a badge of honor on social media sites. Thanks for stopping by and for your comment. YES, bullying is in on social media and it needs to stop. Disney has protocols in place and if you are truly offended then you should follow those protocols, not bully. Totally agree, Melissa. Unfortunately, technology makes it easier to post photos of people, but we tend to forget that the people we take photos of have feelings too.